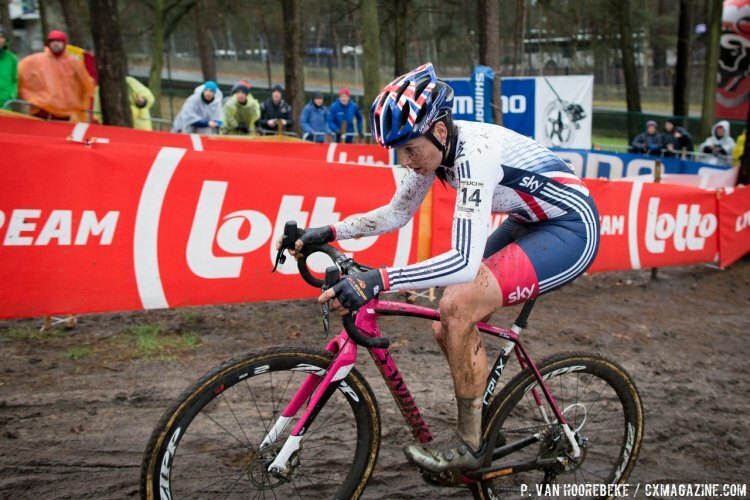 HEUSDEN-ZOLDER, Belgium—The rains from earlier in the day let up for Saturday’s final race as the Elite Women lined up for the 2016 World Championships. 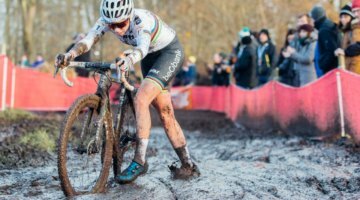 With a field slightly smaller than the U23 Women’s field, 43 racers were primed and ready as the race clock ticked over and began counting down the laps to the jersey-winning finale. From the line it was Ellen van Loy in the lead, which surprised some since she had told our own Christine Vardanos and others that she was ill with fever just the day prior. The field was compact heading to the first turn where American Katie Compton, who herself had a great start, fell and got hung up on the course fencing. 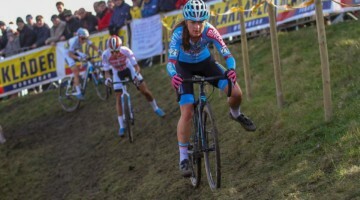 Early on, it was British rider Helen Wyman, perhaps inspired some by her younger compatriot’s performance from earlier, trying to replicate Evie Richards’ strong start and dominating ride, took the lead over the first pass of the flyover. 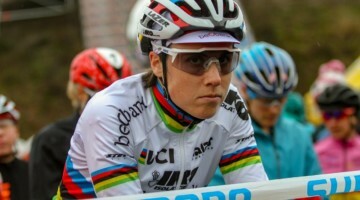 Wyman took to the race’s sharp end with her teammate Nikki Harris in sitting fourth. Cant, Mani, and other favorites were sitting in the top 10, as was Kaitlin Antonneau, while the rest of the Elite American women were grouped together further back. Of course we all knew what Wyman was doing to clean the course as quickly as possible as she had provided us with a preview of the effort the race would take. Before the end of the first lap the lead changed hands from van Loy to Wyman, Harris, and Dutchwoman Sophie de Boer. It was de Boer who took a large lead group through the line after one lap of what would be a four-lap fight. 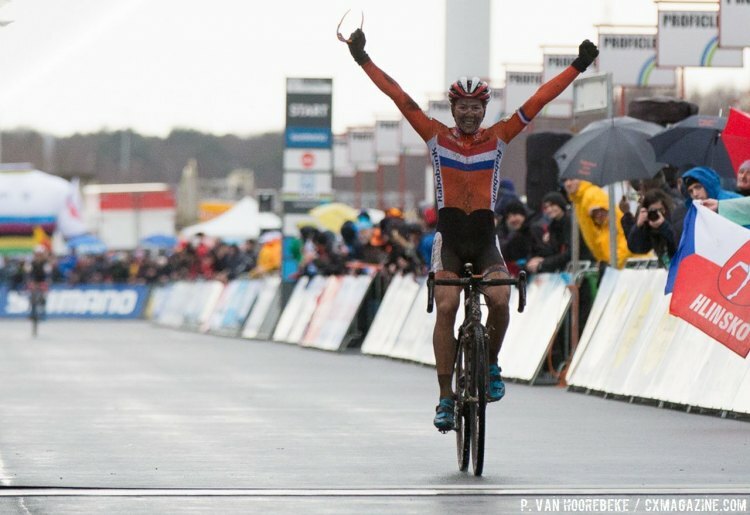 Following de Boer was Harris, World Cup leader and pre-race favorite Sanne Cant, French National Champion Caroline Mani, Luxembourg’s Chritine Majerus, Italian National Champion Eva Lechner and Sabrina Stultiens of The Netherlands. Over the second lap, four riders separated themselves from the would-be contenders. Mani, Cant, Harris and de Boer seemed certain that they would be the ones to fight for the rainbow jersey as each took turns passing the others with Mani controlling affairs on the front for much of the lap. Meanwhile, Australia’s Lisa Jacobs was not going to factor in the race, as she was already out of the race, talking with mechanics in pits, but still smiling. Coming through the end of lap two it was Cant struggling to stay in contact with the other three leaders. Behind the four, a string of riders soldiered on including Americans Kaitlin Antonneau in 8th, Compton in 13th and Elle Anderson in 14th. At the start of the penultimate lap, it was Harris’ turn to make a bid for glory. She took off over the flyover and looked ready to run away from the group and take the second title of the day for Great Britain. But Mani dug deep, with her head bobbing back and forth from the effort, and closed the gap. Meanwhile, Cant flipped back and fourth between third and fourth and Stultiens dangled off the back in fifth, while Thalita de Jong of the Netherlands was putting in a huge effort behind them all in attempt to catch Stultiens and get back to the leaders. Up front it was a test of wills and skills as if each rider was taking a turn on the front for half a lap while the others fought for the wheel. 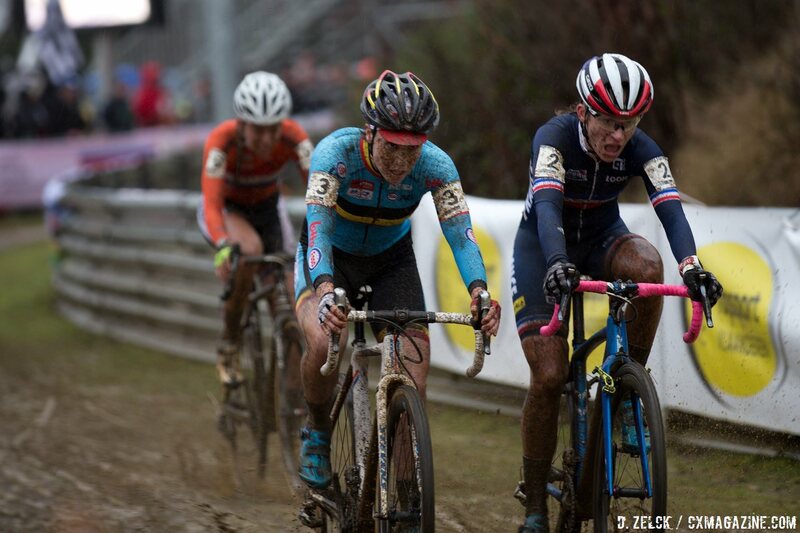 And whether it was tight racing, tactical forethought or mind games it wasn’t working. Dutch road racer de Jong was coming up to them quickly. Within one section of the leaders pausing to look around, the lead was gone and de Jong made the catch. On the course’s difficult run up, de Jong was on the back of the lead group and it looked briefly like she might have brought Stultiens and Lechner along for the ride. But at one lap to go it was a furious fight between what was now five riders. Trying to confirm her status as the top favorite and top returning racer from Tabor, Cant took to the front at the start of the last lap and instantly strung out the group. The only person to stay in contact was a determined de Jong. 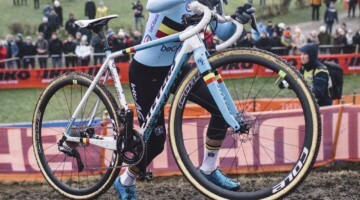 On the newer section of the Zolder circuit that traversed a wooded plot, de Jong put her road speed to use and put in a hard attack leading to and over the flyover. Cant had no answer for de Jong’s move and Mani, meanwhile, was back on Cant’s wheel and looking to pounce. Heading to the lower part of the course and the final pass of the pits, none of the leaders risked changing bikes. Nikki Harris, who had earlier looked like a medal contender, was clearly fatigued from the early effort and coming down one of the final short, steep drop, nearly lost control but somehow avoided going over the bars and into the inflatable barriers. 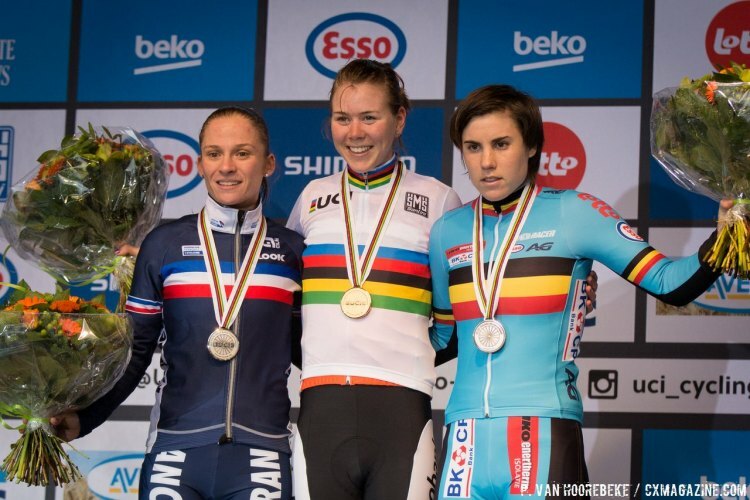 Just in front of her on course, Mani, with her face revealing her all-out effort, made her pass of Cant, leaving her to do nothing more than simply watch the silver medal ride away in pursuit of de Jong and the gold medal that was moments away. De Jong had ridden from near the back of the field and gone all the way to the front for the victory. Caroline Mani had an inspired ride to take the silver, while Sanne Cant, once again in tears, was clearly disappointed by her bronze medal. For Team USA it was bitter sweet. 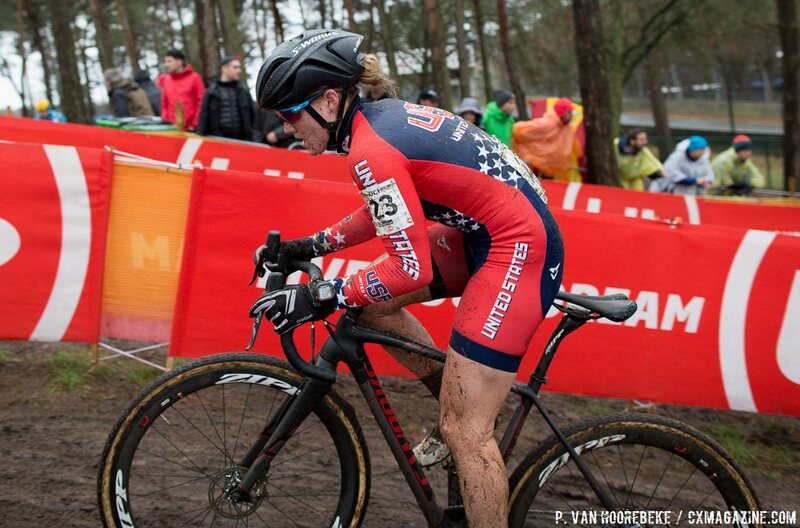 With three of the top four racers from Tabor not starting in Zolder, there were high hopes for an American medal, mostly likely by Compton, but it was not to be. 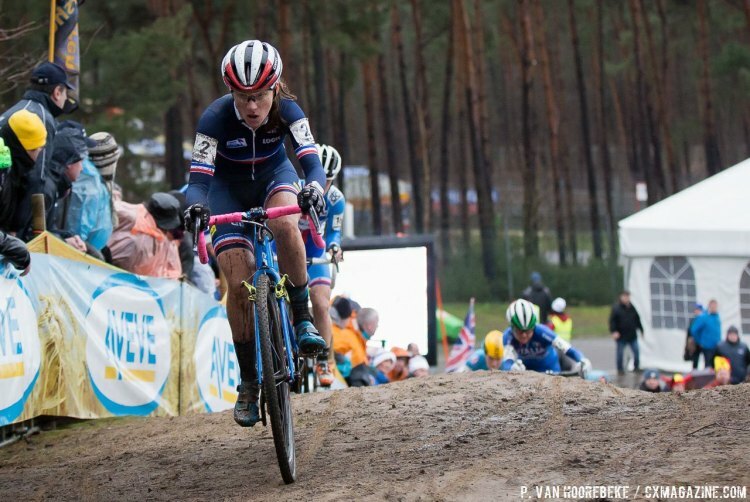 Kaitie Antonneau had a strong ride to finish in eighth, while for Compton, it was another frustrating ride after she crashed in the first U-turn and had to chase back coming in 13th. Following Compton in her chase was Elle Anderson who was 14th. 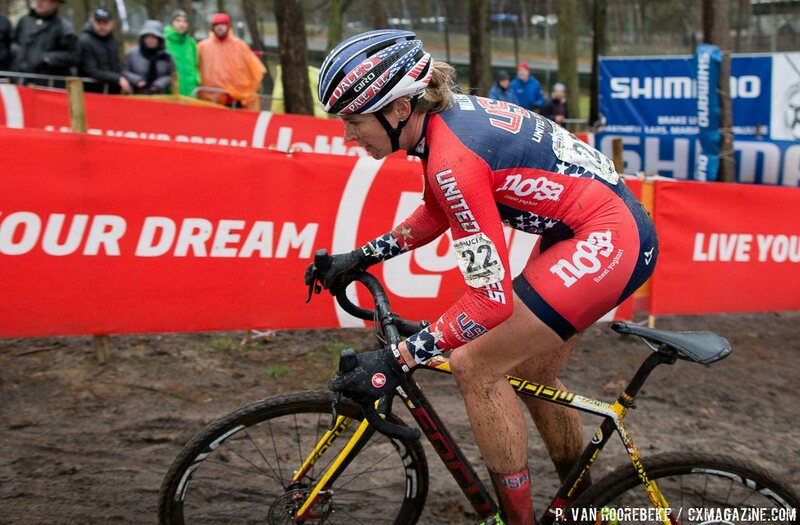 Meredith Miller and Amanda Miller was 23rd and 24th while Crystal Anthony was 32nd for Team USA. Adopted American, Caro Gomez Villafane of Argentina was 35th. The lone Canadian Mical Dyck, perhaps also the only tubeless racer in the field, finished 16th. Nikki Harris and Helen Wyman of Great Britain were 5th and 11th. Australians Natalie Redmond, Josie Simpson and Therese Rhodes finished 36th through 38th. Be sure to read about Sunday’s Junior Men’s race and the historic first U23 Women’s World Championship races as well as the exciting U23 Men’s race and the Elite Men’s fight for the rainbow stripes. There are also additional photos from the Elite Women’s race in our gallery below the results. Help! Looking for a live stream for the upcoming Elite Men’s Sunday but nothing’s open for viewing to the US!?!? 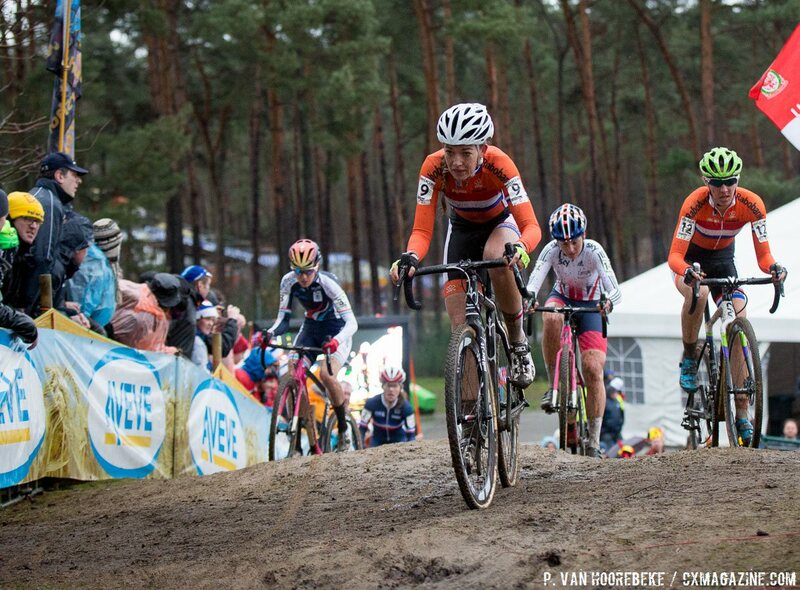 Amazing come from behind win, and what a ride by Caroline Mani for silver!